This MURS Multi-Mile Handheld unit can be used with our MURS Multi-Mile Base Intercom base station and the MURS Commercial base station intercom. Use the handheld if you need to roam around your property or business and still be in touch. You can also use these MURS handheld units in together without using any base station intercom. These units also have a range of up to 4 miles. The MURS Multi-Mile Handheld Intercom has rechargeable batteries, a headphone jack for private listening, and works on all the same frequencies as our other MURS wireless products. HTML clipboardSee the applications and other products available for MURS in the MURS Product Brochure (requires the free Adobe PDF Reader to view and print). 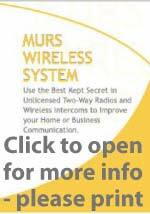 Works with all MURS base station products. Fully expandable to an unlimited number of handhelds and base stations. Add additional intercoms to your system as needs change. Monitor button is used to monitor conversations on sub-channels to see if there are any conversations before you transmit. (This feature does not work like a baby monitor and cannot be used to continuously monitor an area around the handheld-the FCC does not allow continuous transmit in this frequency). Removable antenna allows changing antennas. Four selectable call tones to page other users. Handheld has five channels with 38 sub-channels. Both channel and subchannel on other units must be set the same to communicate. Powered by the included 6 rechargeable AA batteries (last for about 40 hours per charge). An AC charger is included with the handheld. Handheld units can also receive a signal from the MURS Alert 4 mile wireless motion detector that can be easily set up in nearly any location to monitor and notify when someone has entered a monitored area. Will communicate up to 4 miles on the South Dakota prairie or similar open topography. Expect your range to be less in buildings, with electrical interference, or with obstructions in the way. This unit does not have a gate opening control button. We bought this one so we could take it to the garage or outside with us. We own a small burger bar and when the girls need help they can just call us. Seem to work fine as radio etc, however, we wanted to use them as notification for disabled folks. If they need to alert someone to pick up and talk. The call alert is woefully inadequate, The tone is just little tinkly tone that cant be heard very far or well, the alert tone needs choice of a high decibel siren or alarm, not little hokey dancing tone. Can not hear alerts if at pool and music being played, must add high pitched siren or fire alarm type sound. We needed to order another hand held radio and the ordering process is still as great as it was last year! all units works as described and has made my life that much easier! !